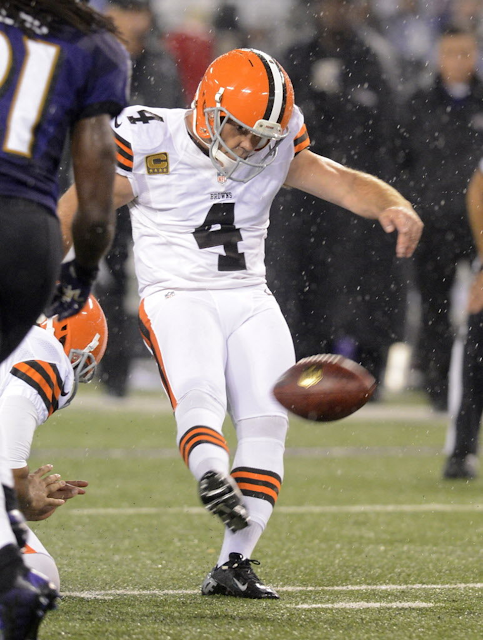 Through wind, snow and rain, Phil Dawson always seems to come through for the Browns as he did on this kick Thursday night in Baltimore, one of three from at least 50 yards that he made against the Ravens. BEREA, Ohio -- The best kicker in local history is not nicknamed for his toe and wasn't drafted by the team with which he has spent his whole career. Or by anyone else. A Cleveland kind of guy, even though he is from the sunny climes of Texas, Phil Dawson was an undrafted free agent who was released twice before landing with the expansion Browns in 1999. He still plies his trade in the snow, mud and wind of the AFC North, including the lakeshore gales of Cleveland Browns Stadium. He has never made the Pro Bowl because he plays for the Browns. He won't make the Pro Football Hall of Fame for the same reason. Not even defying age will do the trick. At 37, in his 14th season, the Browns' place-kicker is not only better than ever, but is among the best of all-time. He has made 284 of 340 field goals, or 83.5 percent in his career, which is the 11th-best accuracy mark of all-time. But here's the real "kicker" to the story: Only 10-for-18 from 50 yards or farther for his first 11 seasons, Dawson is 11-for-12 from loooong distance from the start of last season through the rainy Thursday night loss in Baltimore. "Heavy ball, wet environment, and old Phil Dawson just keeps going," said Browns coach Pat Shurmur after Dawson slammed three field goals of 50 yards or more through the uprights. Dawson credits increased strength and flexibility for supersizing his career in what should be twilight. That's because the ball certainly isn't flying any farther than it did before. As for performance enhancing chicanery -- puh-leeze. At 5-11, 200 pounds, Dawson looks like your neighbor, not an NFL player. He kicked two extra points in a loss to the Rams in December in 2003, which would not be remarkable, except he did so in a game in which he broke his left arm. He went career-long in November of 2008, simply giving former coach Romeo Crennel a nod, signifying that even the cold, speculative fringes of possibility were within his range. Then he kicked a 56-yarder high and true through the 14-mph winds of Orchard Park, N.Y., to win the game, 29-27. If Dawson is known nationally for anything, it is for his game-tying field goal off the goalposts' support, the "gooseneck," in Baltimore in 2007 on the last play of the game. It was a 51-yarder, which was first ruled no good, then good. Another Dawson field goal then won it in overtime. It was the Browns' last victory over the Ravens. Usually, kickers are either known as long bombers or chip-shot artists. Dawson, though, is both. The Raiders' thunderfoot, Sebastian Janikowski, is 31-for-59 for his career from 50 yards or more. Overall, though, he's at 79.9 percent, not as good as Dawson. Groza had an outlier season in 1953, making 23 of 26 field goals, 88.5 percent, when the rest of league was at 41.3 percent. Washington Times' sports columnist Dan Daly combed through the play-by-play sheets for his book "The National Forgotten League" and found that Groza mainly made tap-ins. Only four of his field goals were longer than 30 yards. Due to the rise of soccer-style kickers, NFL field goal accuracy in the 1960s for the first time was higher than the league's quarterback completion percentage. The gap has only grown since then. So the very glut of good kickers keeps Dawson from standing out as much as he should. With pro football being such a big-game sport, a career spent with the Browns has also kept Dawson from such moments former Patriots kicker Adam Vinateri twice experienced, breaking ties with last-play field goals in the Super Bowl. Since the franchise's rebirth, Dawson has been an island of professionalism amid the stormy seas of the organization. After the second-half kickoff in the last home game against Buffalo, Dawson watched his sons, Dru, 11, and Beau, 9, race each other to pick up the tee. Dawson, only half-jokingly, said he was afraid a wrestling match might break out over it. Thursday's Baltimore game, Dawson's 203rd in a Browns uniform, left him tied with former tackle and current radio analyst Doug Dieken for third place on the franchise's all-time list of games played, behind Clay Matthews and Groza. In the locker room afterward, Dawson presented Dieken with a signed ball. "203," was scrawled on it. Beneath it, Dawson wrote, "To a has-been from a never was: We fooled 'em for a long time." That's not true. On many given Sundays, he's been all that was hot in Cleveland.